With its white-sand beaches and nice weather, the far southern Caribbean island of Barbados is a magnet for vacationers. It is also a magnet for geologists and climate scientists. 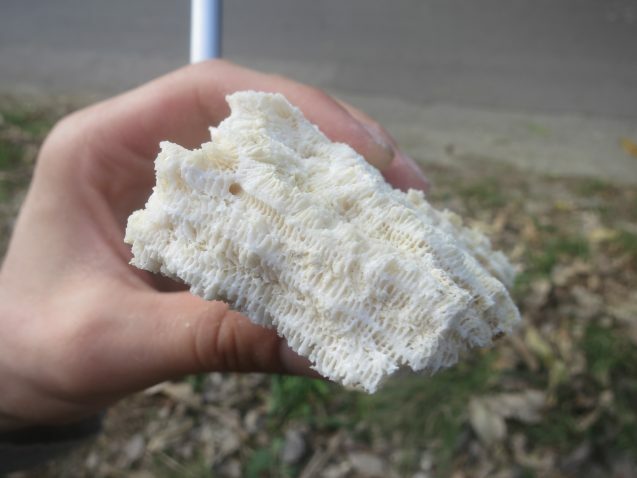 That is because it is made largely of fossil corals that reach from its shoreline high into the hilly interior. Within these deposits lie exquisitely preserved records of past sea levels—perhaps the most obvious barometer of past climates. Barbados has been pushing upward from the seabed for hundreds of thousands of years, probably fairly steadily. At the same time, sea levels have been rising and falling against it as climate has warmed and cooled, leaving footprints via the formation or death of the corals. Thus the island embodies a relatively accessible chronology of past climate swings. Decoding their exact timing and magnitude may help researchers project how far seas will rise during our current age of human-induced climate change. 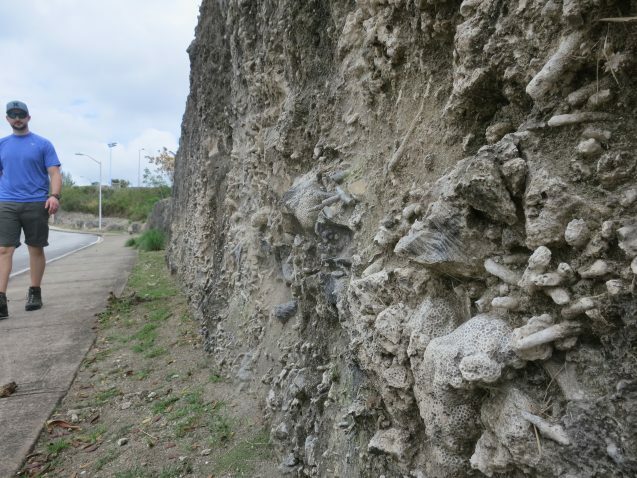 Geologists have been intrigued by Barbados’s fossil corals since at least the 1840s. In cross-section, the island looks like a staircase, composed of successively higher cliffs and terraces as one moves inland. In many places, cliffs reach up dozens of feet, terminating neatly in a plateau, which then runs into another cliff further on. Some scientists long argued that the island formed all at once; but for others, the stair-step formations suggested a gradual rising process, with each successively higher cliff and terrace formed by wave action. In the 1960s, chemical isotopes used for measuring the ages of rocks showed that the latter was the case. In most geologic formations, the oldest rocks lie at the bottom, younger ones on top. In Barbados, it is the reverse. The oldest corals, currently estimated at 500,000 to 700,000 years, are on the high ground, the youngest along the shore. Just offshore under the waves, living coral reefs are building their skeletons, and will probably one day also rise onto dry land. The island is rising because the tectonic plate making up the Atlantic Ocean bed is slowly shoving under the plate making up the Caribbean. In the process, a giant pile of Atlantic muck is getting scraped off at the plate boundary and piling up into an ever-rising wedge. Barbados is riding up on this wedge. Current estimates say that it has been rising about a foot every 1,000 years, for hundreds of thousands of years. 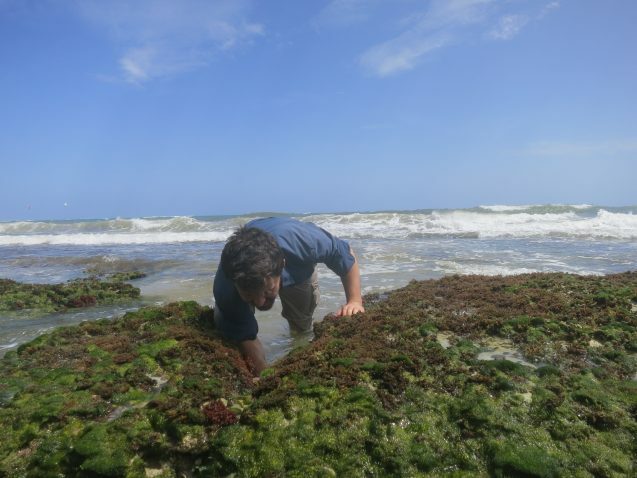 Reefs now stranded far inland hold the remains of countless creatures—and clues to ancient sea levels. Key papers in the late 1960s by Brown University geologist Kenneth Mesolella and Lamont climatologist Wallace Broecker showed that, superimposed against this steady rise, past coral growth has stalled or restarted with rises and falls in sea level. Furthermore, they showed that the timing of the sea-level shifts matched so-called Milankovitch cycles, a series of repeated overlapping changes in Earth’s orbit thought to cause the cooling and warming of the Earth—and thus the waxing and waning of ice ages—over tens and hundreds of thousands of years. These studies of Barbados were key to nailing the now well accepted theory that Milankovitch cycles are a master controller of planetary climate. The results of natural swings can be seen as analogs to what may result from human-induced warming. However, there are still questions about the exact timing and magnitude of such swings, and how quickly ice sheets, and thus the sea-levels, respond to them. Barbados is an ideal place to examine these questions. The group’s trip began with a two-day reconnaissance to identify sites for sampling corals. One of the first stops was Batt’s Rock, a popular beach in the southwest of the island. The dirt parking lot just behind the beach was backed by a steep cliff, cut by a series of shallow caves. Raymo said the caves, currently only several feet above sea level, could have been notched out by wave action as little as 5,000 years ago. This. she says, was a brief warm period when sea levels resurged enough to overcome the rising of the island. 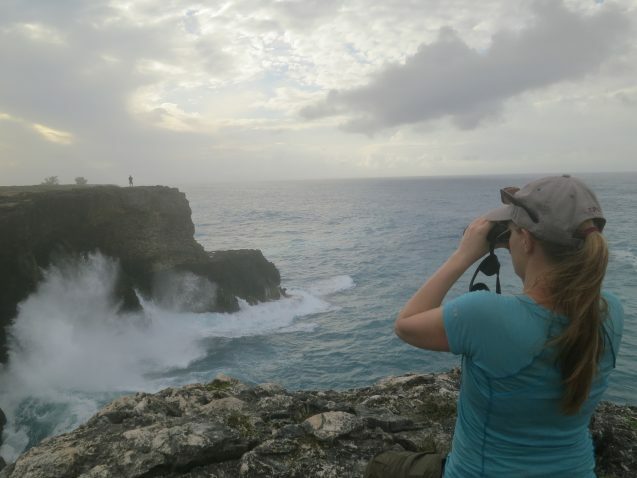 Team leader Maureen Raymo checks an outcropping old reef near the town of Oistins. We walked upward through a steep road cut through the cliff to a busy road, located on a flat terrace above. Above this, another cliff and road cut ascended to the campus of the University of the West Indies. 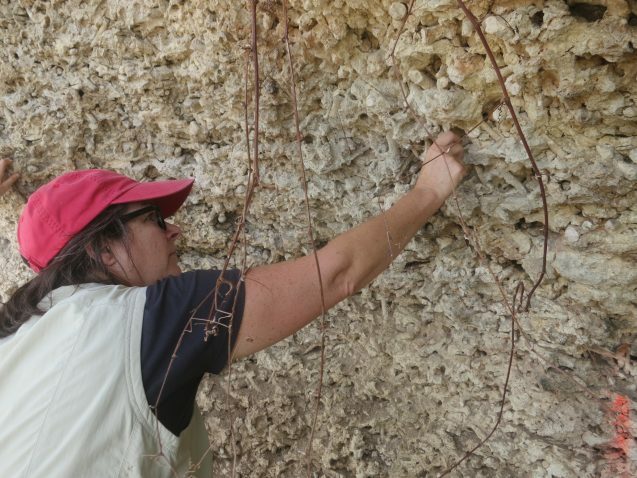 All along, the remains of ancient reef creatures were conveniently exposed in the vertical walls: brain corals, pillar corals, star corals, urchins, molluscs, worms. 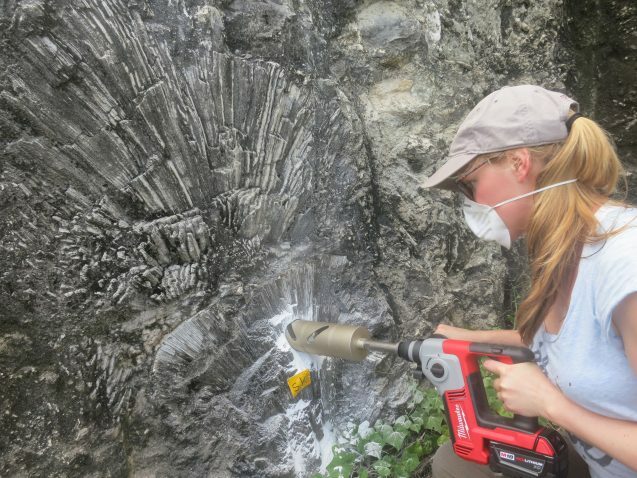 There were also plenty of golf-ball-size drill holes where previous researchers had taken out samples. These previous researchers have estimated the ages of many sites, including the section near the university, which is said to be about 120,000 years old. But now more exacting isotopic techniques have become available, some of them pioneered by members of the team. This includes the interpretation of subtle changes in the element strontium, developed by Raymo’s grad student Michael Sandstrom, which would be the object of much of the sampling. The team also had brought along GPS instruments that would allow them to fix the locations and elevations of samples with far greater precision than past researchers have been able to do. Raymo’s group is looking at a few key periods of the past. In other expeditions to southern Africa, Patagonia, Australia and the U.S. East Coast, they have zeroed in on sea levels during the Pliocene. This period about 3 million years ago saw temperature about 2 degrees Centigrade above current levels—what we may hit by end of this century—and atmospheric carbon dioxide levels about the same as now. They are also interested in bouts of apparent rapid warming in between ice ages, some 400,000 years ago, and again some 120,000 years ago. These periods also were just a bit warmer than today. Postdoc Robert Poirier chisels out a coral sample for analysis. Sea-level modeler Jacqueline Austermann drills out a piece of large brain coral. Sea levels during all these periods were almost certainly higher than now, but estimates of how much higher vary wildly. Mid-Pliocene seas may have been 30 to 120 feet higher than today, or anywhere in between. At the 400,000-year mark, one controversial estimate puts the level at 60 feet higher; Raymo asserts it was more like 18 to 40. A 2009 study done in Barbados by other researchers suggests that 121,000 years ago, seas rose as much as 9 feet in just a century—perhaps due to a sudden collapse of the Western Antarctic Ice Sheet. If it could happen then, it could happen now, said Raymo. Using the newly exacting methods, she wanted to see if it really was so. In searching for sample sites near the town of Oistins, a couple of grad students walked up to the gated yard of retiree Ronald Blackmore and struck up a conversation. Blackmore's house sat on a dead-end street that backed up to a nicely exposed cliff probably in the 120,000-year range. When the team explained what they were looking for and why, he was eager to help out, and gave permission for them to work on his property. 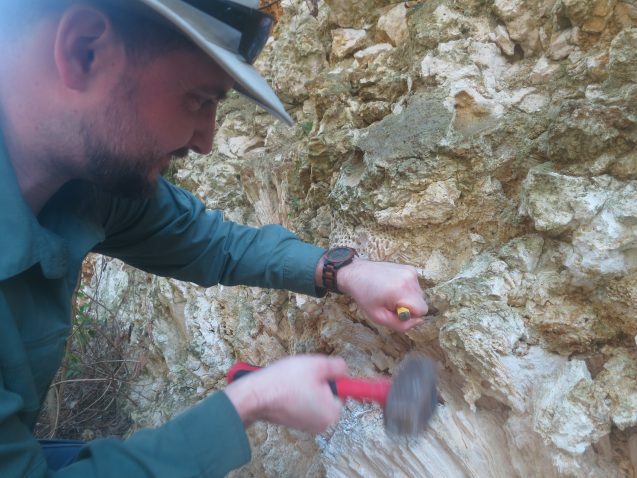 For much of the next day, the team hammered and drilled out samples from the cliff. They took out chunks of spreading elkhorn corals, fernlike Monastrias, and part of the perfectly cross-sectioned head of a giant brain coral. All were in growth position, meaning that this section had been lifted directly out of the sea and preserved intact, with the coral heads pointing skyward-not jumbled and redeposited by waves from some subsequent sea-level rise or fall, which could easily confound age measurements. After the sampling, Jacqueline Austermann, a Lamont scientist who specializes in modeling past sea levels, ran down a list of other factors that have produced conflicting estimates. Most actually have to do not with water, but land. For one, she said, when miles-thick ice coats high-latitude continents, this depresses the crust. Like a balloon that has been squeezed, iced-over coasts on the continental margins get squished upward—the so-called forebulge effect. When the ice recedes, the opposite happens; land in the interior rises, and the coasts sink. Coastal sinking began taking hold in many places some 15,000 years ago, when the most recent ice sheet to cover North America receded. Today, much of the U.S. East Coast and outward as far as the Bahamas is still sinking, measurably magnifying sea-level rise around New York City and other areas. Reef organisms build their skeletons year by year, preserving chemical isotopes that can be used to date deposits. This specimen could be hundreds of thousands of years old. On the other hand, when ice melts and sea levels rise, the increased weight of water presses down on the seabed. This causes some coastal areas to bulge up—a process called continental levering. This may partially counteract the rising waters in places. The opposite happens when sea levels fall and relieve pressure on the sea bed. All these phenomena work on different time scales in different areas, playing out against each other in often confusing and contradictory ways. Even Austermann, a world expert, admits it is mind boggling to try to figure out what the ocean really was doing at any one time. Barbados is a good place to start, though, she said, not only because of its fossil corals, but because it is close to the equator and relatively isolated from most effects except water level itself. “We like to call Barbados the dipstick of sea level,” she said. 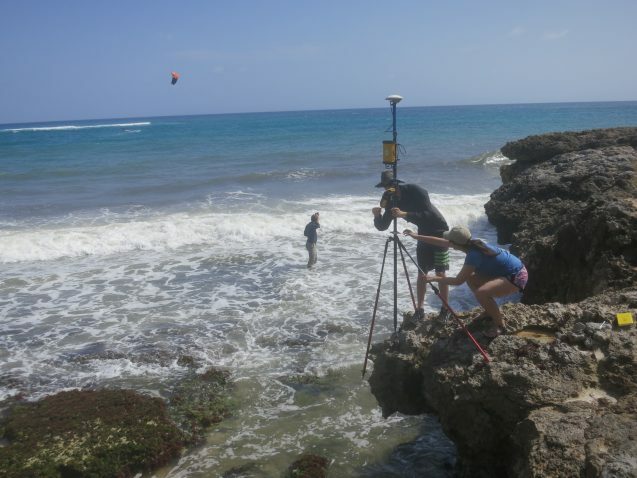 High-precision measurements of reef locations and elevations are vital for making proper calculations. Grad students Michael Sandstrom and Miranda Cashman set up a measurement at the very edge of the modern shore, at a popular kite-surfing spot. Several team members were set to the unenviable task of banging out samples from lower-level road cuts for several days. Here, there was little to no shade to protect from the fierce tropical sun, and trucks and cars roared by constantly just feet away, leaving trails of exhaust. Others of us scouted the high country, where pleasant winds jostled vast sugar-cane plantations and dairy farms sprawled out over the terraces. In addition to nailing down exactly how fast the sea rose 120,000 years ago, Raymo wanted to settle the question of just how old the island’s oldest rocks are. No one has yet determined this, but the high ground would be the place to look. We happened upon the Apes Hill Club, a gated enclave on series of high, rolling hills dedicated to golf, polo and expensive homes. Raymo showed her university ID to the friendly guard, and talked her way in. Soon we had the manager’s permission to take samples. The following day we all drove up there. Apes Hill is a sort of lost world, preserved from the helter-skelter of development below. There were views of both the Atlantic and the Caribbean, far below. Hundreds of feet above sea level was a row of spectacular sea caves, curtained in by hanging tree roots and filled with intact corals. Further up the road, a waterfall cascaded down a cliff face into a round pool. “It almost looks artificial,” said Steven Goldstein, a Lamont geochemist. It turned out he was right; close examination showed that the pool’s edges were concrete made to look like rock. A water pump cleverly camouflaged in the bushes was the waterfall’s source. Postdoc Blake Dyer retrieves a tide gauge, set out to calibrate current-day variations with ancient ones. The rest was quite real. At about 750 feet elevation, the golf course’s 16th hole sat in the shadow of a huge sea arch laced with tooth-like stalactites and stalagmites. If you looked through the arch toward the 17th hole, the arch strongly resembled the jaw of a super-gigantic Tyrannosaurus rex. As the team prepared to take a sample from a nearby cliff, a golf ball whizzed into a pond nearby. As Dyer hammered out a sample, one student was stationed as a precaution to watch out for falling rocks, another for flying golf balls.